Starred Review. Potter fans, relax—this review packs no spoilers. Instead, we're taking advantage of our public platform to praise Rowling for the excellence of her plotting. We can't think of anyone else who has sustained such an intricate, endlessly inventive plot over seven thick volumes and so constantly surprised us with twists, well-laid traps and Purloined Letter-style tricks. Hallows continues the tradition, both with sly feats of legerdemain and with several altogether new, unexpected elements. 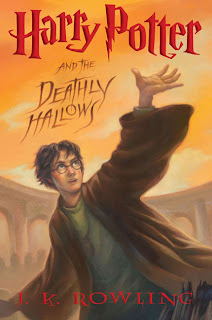 Perhaps some of the surprises in Hallows don't have quite the punch as those of earlier books, but that may be because of the thoroughness and consistency with which Rowling has created her magical universe, and because we've so raptly absorbed its rules. We're also seizing the occasion to wish out loud that her editors had done their jobs more actively. It's hard to escape the notion that the first three volumes were more carefully edited than the last four. Hallows doesn't contain the extraneous scenes found in, say, Goblet of Fire, but the momentum is uneven. Rowling is much better at comedy than at fight scenes, and no reader of the sixth book will be startled to hear that Hallows has little humor or that its characters engage in more than a few fights. Surely her editors could have helped her find other methods of building suspense besides the use of ellipses and dashes? And craft fight dialogue that sounds a bit less like it belongs in a comic book? Okay, we're quibbling. We know these minor nuisances won't dent readers' enjoyment, at least not this generation of readers; we couldn't put Hallows down ourselves. But we believe Rowling, and future readers, deserved even better. Well, I'm back in Chicago after a picture-perfect trip to New Zealand and Australia! Sadly, I haven't had much time to settle in and read since I've come home, but I hope that at some point soon, I'll be curled up on the couch with a good book (but not too soon, as the summer weather is pretty amazing after winter in NZ and Australia). I was lucky enough to get a copy of the newest Harry Potter early morning July 21st at the Brisbane airport, even though I had one waiting for me at home. Good thing I decided to buy another one, though, because I had a LONG flight and LONG delays and Harry, Ron and Hermione really helped! I really enjoyed Deathly Hallows, but it didn't hit me the way some of the other books in the series did. It was REALLY slow at parts (REALLY SLOW), and then seemed only to speed up in the last 150 pages or so. And for the first 450 pages, it was really just all Harry, Ron and Hermione- and then again, at the end, we once again saw the characters we had grown to (or hate) previously. Luna, Neville, Snape, Draco, Professor McGonagall, the Patil twins. Which felt a bit like a letdown for me. It is entirely possible that it was a letdown for me only because I knew it was the last book of the series and therefore knew that I would never see these characters again- and really, how can one ever get enough of Luna? And yes, I knew that the book was bound to be far more intense than its predecessors, and much darker and more depressing. But that doesn't mean that I didn't want it to have its moments of hilarity and fun, too. It seemed to be a lot of build-up (450 pages worth) for one MASSIVE scene of fight after fight (and a very random, in my opinion, interlude) for 150 pages. I also admit to having expected a bit more about the Dursleys and about Harry's dad somehow transforming from total jerk to fun and upstanding wizard. But no go. That said, I liked the book. It had me enraptured for several hours of uncomfortable airplane seating and airport lounges, and I finished it before I even got to Chicago (it helped that July 21st was about 30 hours long for me). It was an emotional and hard-hitting end to a great series, and I think I still haven't quite understood all its implications- I'll probably have to go back and read it again, once I have another 30 hour day. Because I don't know if I am quite ready to put away Ron, Hermione, Neville and Harry for good. You're alive! I was wondering how things were going for you. Get in touch when you get a chance! Welcome home Aarti! I hope you had a fantabulous time in Australia and New Zealand! Welcome back! I haven't read the last Harry Potter yet. I keep putting it off becaue I don't want the whole series to end. I'd like to start from the beginning and just read them all in a row!